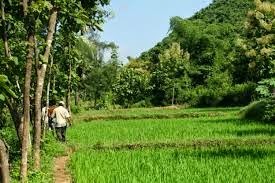 In this belt of villages near the fertile Krishna River delta, much is as it has been for generations: The cotton soil is as black, the mango trees as heavy with fruit, the tobacco fields as fragrant and deeply green as ever. But there have been curious changes in recent months. An old temple has received an expensive renovation, complete with a new banquet hall, courtesy of community donors. Some plots once tilled by small farmers lie untended, nothing more than overgrown grazing fields for cattle. Locals say “For Sale” signs have been replaced by “No Sale” signs as farmers try to fend off a rush of buyers who seem to have appeared overnight.